"The best dinky little restaurant in the Commonwealth for over 30 years." That is how The Bayside Restaurant - one of the most popular restaurants in Westport - describes itself on their sea-themed Web page. 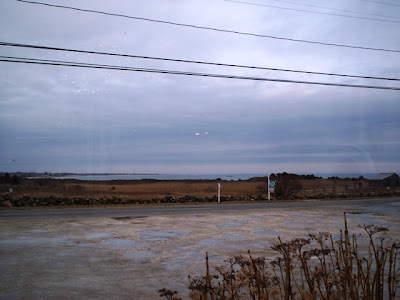 Typical of New England Bites, we had driven by this restaurant on several trips to the Horseneck Beach area and always wanted to stop in. However, the massive summertime crowds had completely overtaken the restaurant and Mom and I - being hungry and impatient - did not want to wait for a table. We decided to wait until the off-season so that we could a) actually get into the place, and b) see if the food is any good. 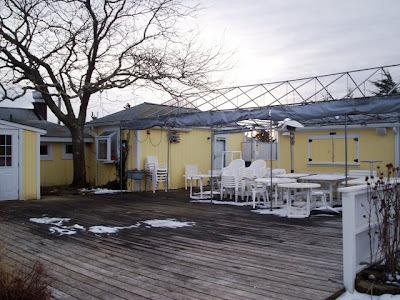 We pulled into the clamshell-filled parking area at just after 4 p.m.
Before stepping into the restaurant, we crossed the large deck area which turns into an outdoor dining room overlooking the Massachusetts Audubon's Allen's Pond Sanctuary. Mom - who adores eating outside - talked on and on about how she wanted to sit out there and have a meal someday. When we went inside, we were greeted by a friendly waitress - who we later learned was named Robin - who told us that we could sit anywhere we'd like. Not wanting to miss out on a prime window seat, Mom bolted to the end of the restaurant and chose an adorable table with a great view of the ocean. I guess that was her way of eating outside without actually having to sit outside. The lovely view from our table. Robin left us with two aqua-colored menus and took our drink order. 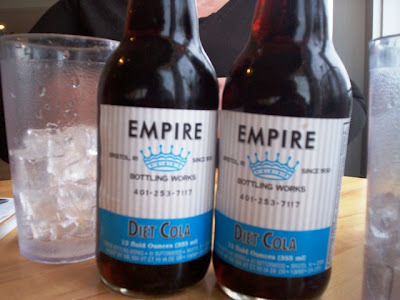 Mom asked for two Diet Cokes or Pepsis, but when Robin returned she'd brought over two bottles of Empire Diet Cola - which is bottled in nearby Bristol, RI - along with two plastic glasses filled with ice. Although the soda had a bit of a Dr. Pepper-like bite to it, it soon grew on both Mom and myself. By the end of the meal we had both commented on how different it was and how much we liked it. When Mom and I were ready to place our order, Robin returned to the table. 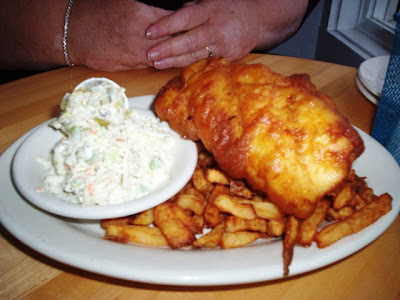 Mom chose the famous fish and chips ($12.99), while I chose the cod fish cakes ($11.99). 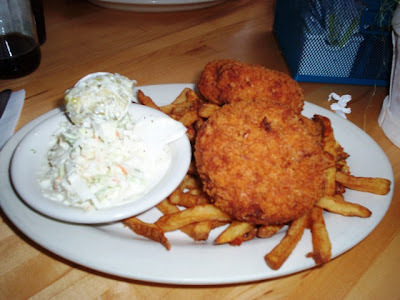 Both dishes came with a side of cole slaw and tartar sauce, and I also chose fries to go with my cod fish cakes. 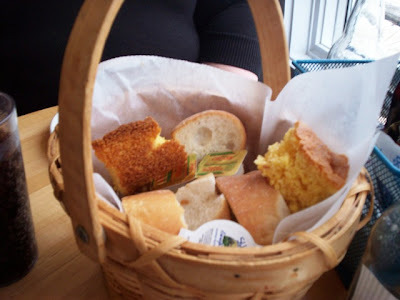 A few minutes after we ordered, Robin brought over a lovely bread basket with two pieces of fresh corn bread, four slices of what seemed like Italian bread, and several pats of butter. Everything was delicious. Both Mom and I absolutely fell in love with the decor. From the beechwood furniture to the real daffodils placed on each table, Bayside just screamed summertime. Strings of white lights hung on the windows and pictures of mermaids and fish were scattered throughout the dining room. There was a large chalkboard on the wall that featured their daily specials, and a good mixture of both tables and booths. Before you enter the restaurant, there is a small area with books for sale and a pinboard covered with local business cards and advertisements. 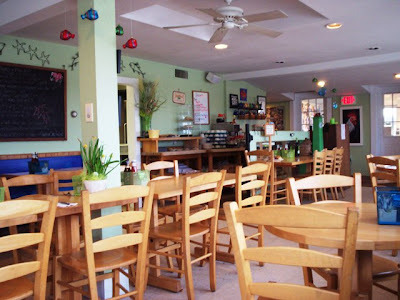 The Bayside Restaurant is also the first certified green restaurant in Massachusetts! They use only the freshest locally-grown fruits and vegetables and organic dairy products while staying away from all preservatives, additives, and enhancers. Some of the menu items include native littlenecks, salmon-asparagus wraps, quahog chowder, lobster rolls, vegetarian quesadillas, New Bedford scallops, beefalo burgers, eggplant fries, Maine fried clams, a fisherman's platter, and several different homemade desserts. All prices are about average for the area. Bayside also has a full liquor license which features drinks from the Westport Rivers Vineyard and Winery. I also spotted a sign for something called the $9 before 7. I believe you can select certain featured dishes before 7 p.m. and receive a bottle of wine for $9, but I'm not sure exactly how it works. However, the table next to us was taking advantage of this and said that it is the best deal in town. Our meals came out of the kitchen fairly quickly. Both plates looked delicious and arrived piping hot - always a plus in our book. Mom's plate had a healthy portion of flaky, white cod with a crispy crust that was cooked to perfection. It came atop a mound of hand-cut fries which had a great homemade potato taste. Mom loved this dish and would love to have it again ... soon. My cod fish cakes were delicious. Both cakes were crispy on the outside, yet soft and tasty on the inside. The light cod flavor went well with the fresh vegetables that had been added to the cake mixture. I, like Mom, loved the fries, as well as both dishes of cole slaw (Mom never eats hers). Even the cool tartar sauce was good, and I was thankful to have it as my cod fish cakes were extraordinarily hot. I really enjoyed this meal. After we finished our meal, Mom and I started thinking about dessert. We had heard that Bayside made all of their desserts from scratch, so when we spotted a whiteboard advertising a few tasty choices, we just had to order some. 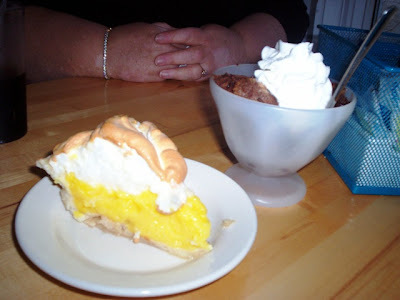 I chose the lemon meringue pie ($3.95), while Mom chose the chocolate sweet bread pudding ($4.95). Both large desserts arrived quickly, and each one was absolutely fantastic. Mom's chocolate sweet bread pudding was served warm and covered in a hot fudge sauce, whipped cream, and loaded with nuts, while my lemon meringue pie was cool, creamy, and had a great tangy taste. We left $46 on the table for Robin, which included a 20% tip. She was an excellent waitress. Before leaving the restaurant, both Mom and I had a chance to check out the ladies' room. Like the dining room, it was very cute and clean - but boy was it small! Perhaps we shouldn't have had that dessert after all. 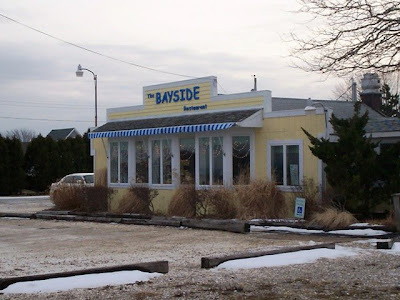 Now that we can finally cross The Bayside Restaurant off of our "to visit" list, both Mom and I can honestly say that the food is well worth waiting for in those long summertime lines. Besides, we have to come back so that Mom can eat on the deck surrounded by the cool ocean breeze. The Bayside Restaurant is open seven days a week in the summer, and five during the rest of the year. For more information, visit their Web site at www.thewestportbayside.com.